www.sausagemaking.org • View topic - Gritts - Gritz wurst sausage? I am looking for some guildlines or recipe or we call (us) grit(s), my mom says Gritts Sasuage, it might be more along the lines as Gritz Wurst sausage. 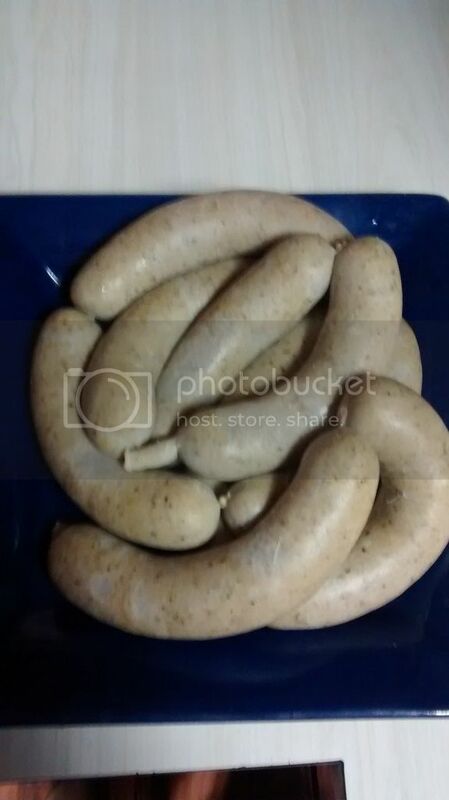 My moms, mother (german) use to make a gritt sasuage & stuff it into larger hog casing. They used head pork meat so it did not go to waste, it was very good for breakfast sausage. Not a lot of info online or at least I cannot find. I would like to try and make some. Any ideas appreciated? So far all on know they used head meat mixed with grits, she remembers garlic stood out and maybe onions. From what I have read online the meat is precooked then ground? Re: Gritts - Gritz wurst sausage? My first thought might be something like the Czech's jiternice, which was head meat, liver, and they used rice or barley as a filler; the bodan (sorry for the incorrect spelling) from Louisiana is the same idea and techniques, definitely rice. I suppose the Germans down around Fredricksburg or New Braunfels would make use of grits instead of the oats, barley, rice options. Sounds a lot like scrapple or goetta. thanks for reply's, good reading. Those recipes have to be very similar, she did talk about a broth. My mom says she has her mom's recipe and if I get it will post it up here later. my mom has made this before when I was a kid, I remember coming home from school and seeing a pig head sticking out of the bucket on the floor. it was good with eggs. She been trying to find it for sometime or something close and never could find anything, so I am going to try and make something close. Here's my mom mother's recipe. There are no instructions, and measurements are not that clear. I think I will follow the cooking instructions for 'Czech's jiternice', it seems to be rather close. Note: if beef liver, heart, tongue is used, use less. I see buckwheat is rather expensive, more expensive then the meat. Next time if I make again will use barley or oats, or something else to keep cost down. Buckwheat was about 6.00 for small bag, maybe a pound. Going to just use pork shoulder. I do not know how much meat is in a head, nor what organs weigh, or how much garlic is in a box? If you knew how much salt was in a box you could kind of guess. I am thinking a 1 lb per box, but have no idea. Will follow Czech's jiternice somewhat and keep fingers cross. Open to suggestions. This is a scrapple formula, but might help you with amounts and percentages. If you are going to use the head, make sure that the eyes and teeth are removed and then boil it in water until the meat and skin come off of the bone easily. Boil the onions and garlic with the head. When the meat is ready, remove it from the liquid and grind (include onions, garlic and any scraps... skin, offal, or whatever). Retain the liquid. Make sure to weigh your meat mixture and measure out an equal amount of the broth. Start heating the broth and stir in the flour (Cornmeal is the preferred flour, but you could use buckwheat flour, or any other flour of your choice, or a combination). Cook until it is no longer gritty and is fully hydrated. Then stir in the meat mixture and seasonings until you have what resembles a meat porridge. Pour into plastic wrap lined loaf pans. Refrigerate loaves over night, or until they solidify. Take 8 pounds of scraps of pork that will not do for sausage. Boil it in four gallons of water. When tender, chop fine, strain the liquor and pour it back into the pot. Put in the meat, season it with sage, summer savory, salt and pepper to taste. Stir in a quart of cornmeal. After simmering a few minutes, thicken it with buckwheat flour very thick. You might try searching with the spelling " gruetzwurst" or with the umlaut over u. I like the onions put in raw for texture. I ended up making, winging the recipe a bit, taste decent to me. My mom remembers garlic and everyone loves garlic. The recipe looked like it had a lot of onions, I guessed @ least 5 lb per 10 lb batch, it might have been 10 lbs to 10 lbs. So a strong garlic and onion present. My mother bought some from a local store today that makes home made Gritswurst (they called it) Actually, the store that made it got the recipe from a german. He was the original owner of Zicks, sold it to Rogers, then his son went and reopened Zicks that is what you see today. Zicks is kind of well known and sell product in many hunting store and other mail order business. Anyway that's another story. I think Roger's recipe of Gritswurst has been changed and was a little to much over salted, had sage or savory added to it. I just wanted to try it and compare to what I tried to make and see what my mom remembers, she will taste it tomorrow. I separated fat from meat, ground fat through a 5m, then ground everything 2x 3/8 plate with buckwheat and garlic and onions. Mixed salt into 60 ml broth and added to mix, then mixed. Then stuffed. I put links into simmering pork broth for 10 mins. Turned out ok, waiting for feedback from moms taste buds. It has noticeable garlic and onion favor, which we all like. Great with eggs... I might try a small amount marjoram or savory in it next time. Being it had no liver in it and original recipe called for it, wondering if a dash of nutmeg or all spice would add some more deeper flavor? This is really interesting to follow when you live in a country where grits is only known as something mentioned in cowboy films. Thanks for posting it. I did use bobs red mill buckwheat. Well my mom gave me her feedback, she thinks from what she remembers the ones she had growing up had less flavor and dryer. She did like my recipe, though it has distinctive garlic and onion flavor, where the ones she just purchased was more plain. For winging it, I had good luck with the recipe (1st time) and would make it again and everyone enjoyed it, tad to moist, but one from the store a tad to dry and salty with less flavor. Will make again! I made a 1000gr batch of sweetish potato sausage - potatiskorv boy was that good. I had potato sausage before and it did not have much flavor this recipe was good. I had good luck with recipes from http://www.meatsandsausages.com/ so far they been very good right on. Some books and other source recipes are not good, these so far I had very good luck. Really like that site. wheels wrote: This is really interesting to follow when you live in a country where grits is only known as something mentioned in cowboy films. Thanks for posting it. well you know many of our families were very poor during the depression, before and after. Everyone tried to maximize everything like everyone. My grandpa was a farmer and grew potatos and cabbage for some sort of government program during the depression, he always had a plaque hanging on the wall in the office showing this, from gov. Sad times in both countries. Hopefully, we're not returning to them. Just FYI, grits are made from Hominy. Hominy is whole grain American corn / maize that is soaked in a Lye water, and then processed. Hominy that is dried, and ground into a coarse meal is grits. It is typically boiled in salted water like porridge / oatmeal, or farina / cream of wheat. When served as the hot cereal, it might be buttered, but almost never served with sugar or other sweetening like oats or cream of wheat often are. I used to be a certified chef with the American Culinary Federation, St. Augustine Florida.